If you had told me months ago that a city builder about the remnants of 19th century England trying to survive the next ice age would sell hundreds of thousands of copies in its first week on Steam, I’d have guessed you were hallucinating from hypothermia. But that’s exactly what Frostpunk did, and after spending all weekend with the game I’m not surprised. 11 bit studios was previously best known for This War of Mine, a survival game based on the Siege of Sarajevo. In that game you tried to keep a tiny group of civilians alive by scavenging, making tough moral choices, and taking advantage of each character’s unique attributes. Frostpunk is a more traditional strategy game, but it still features the moral pressures of This War of Mine. Instead of the bombardment of a city, the people you lead are a caravan of residents from late 19th century London looking to eke out some sort of existence under the warmth of a giant heat generator in the Arctic. Temperatures across the globe are mysteriously dropping, and vast reservoirs of coal up North are humanity’s only hope of outlasting the deep freeze. As the ruler of a small band of refugees under the harshest of environmental conditions, you’re always making tough choices. Do you feed the hungry first or heal the sick? Bury the dead in a cemetery or simply put them on ice for future use? Work your populace to the bone or allow them downtime to recoup and socialise? Almost every goal in the game stands in tension with another, making it impossible to please everyone, let alone satisfy any particular moral code. For this reason Frostpunk doesn’t fall into a lot of the optimisation traps that make some other building sims feel too easy or just downright boring. Instead, it does its best to make every choice sub-optimal and thus help you share in at least some of the discomfort of the residents of your settlement. In the beginning of a run, it’s enough just to collect resources like coal, wood, and steel from nearby wreckage or natural deposits. Later on it becomes important to reconstitute society from the ashes (icicles?) of Victorian England by adding children’s shelters, churches, and fight houses. You may even eventually surpass London with your own army of labouring automatons. 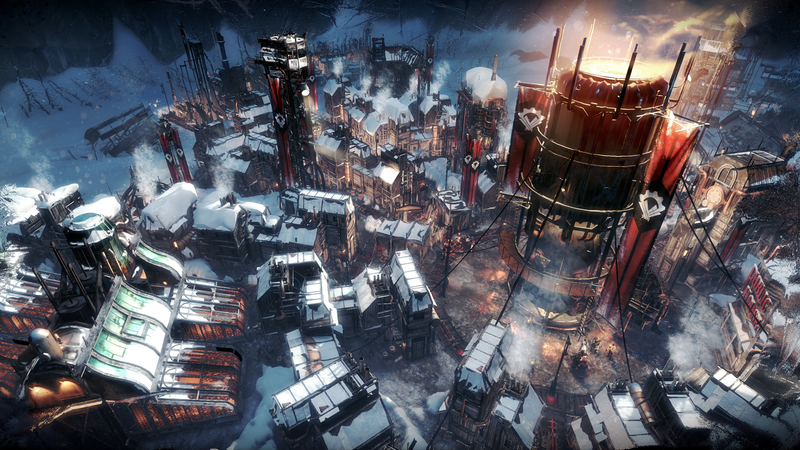 Where some games let you build at your own pace or try to always reach a state of balance and equilibrium, Frostpunk’s constantly dropping temperatures don’t leave you time to get things perfect. Instead, every decision feels urgent and like a matter of life and death. Nothing’s worse than resting on your laurels thinking you’ve finally solved all your settlement’s problems only to see your coal reserves depleted in the middle of the night when a particularly bad cold snap hits. The game also makes every bureaucratic decision feel emotionally weighty by giving everyone in your colony a name and face. When someone gets sick or begins to starve, it’s not just some anonymous worker X, it’s Joe Maven or Jean Graham who has now bitten the dust and orphaned a few children thanks to your brutal decision making. One more than one occasion I literally worked my people to death, not just so we could get the resources we needed to survive a few more days, but also so that there would be fewer of them to need to spend those resources on. The game’s law system lets you invoke legal mandates every so many hours, like 24-hour work days, all of which come with a mix of material advantages and drawbacks. The goal then becomes seeing how far you can push your society to the breaking point before it actually snaps. If you ever wanted to reenact Snowpiercer, Frostpunk is for you. Other times the game doesn’t even allow you to choose whatever you think is the lesser of two evils. To underline how severely dystopian things had gotten, in one playthrough I actually had to let a child freeze to death to teach him a lesson. On a hunger strike in the cemetery, he said he’d only come back to the children’s shelter if I called a town meeting big enough that his mother would wake up, get out of bed, and come attend. But she was dead, and if the only way for him to come to terms with that was to become a fossil, so be it. In Frostpunk there’s no time or extra resources to indulge in sentimental Hollywood moments like these. You either become a tyrannical dictator, religious autocrat, or go to an early grave and take your colony with you. To put it another way: Frostpunk is the kind of game where your hope meter actually rises when you build your first cemetery.